Learn lifesaving skills with professional, experienced and fun instructors by enrolling in CPR and AED courses with Regina First Aid. This St Mark James training provider is one of the most popular first aid, safety, food handling, CPR and AED providers because of easy registration, great staff, fun teachers and low prices. Courses are available at varying times throughout the week to ensure that a course will fit your busy schedule. Participants will learn the latest cardiopulmonary resuscitation and automated external defibrillator (AED) standard and techniques as provided through the International Liaison Committee on Resuscitation (ILCOR) which is North America’s governing body on CPR rescue techniques. Customer also have the opportunity to register for CPR and AED courses that include first aid training such as standard first aid. 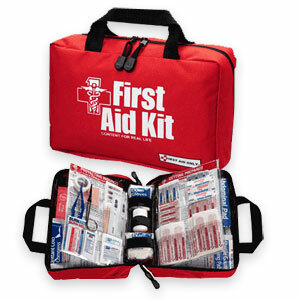 Standard first aid is a workplace approved training course that takes two days to complete. Other courses include food safety training, on-line WHMIS and on-line TDG training. Regardless of the course you want to register for, registration is very easy with on-line, telephone and email registration available. To register for any course, including a CPR and AED course in Regina, Saskatchewan use the contact information posted below, click here or complete the on-line registration form. St Mark James stand-alone CPR training is offered in three different level’s. CPR Level “HCP” which offers comprehensive CPR and AED training for health-care providers. Each of these level’s can be combined with standard first aid training which is also available with Regina First Aid. All prices include a take-home manual, taxes and certification fees. Regina First Aid also offers refresher courses and special classes. Refresher courses are offered to trainees who want to renew expiring or near-expiry certifications while special classes are offered to trainees who have problems with the schedule of the regular classes, and to large groups or companies in need to special training. You can be assured that Regina First Aid offers the highest quality training at the most competitive rates. Why chose Regina First Aid? The rates at Regina First Aid can’t be beat. Regardless what training course you sign up for, Regina First Aid will provide the best value. Regina First Aid promotes the most recent techniques for first aid, CPR, and AED. There is no doubt you can expect to get the most up-to-date training by highly quality trainers. 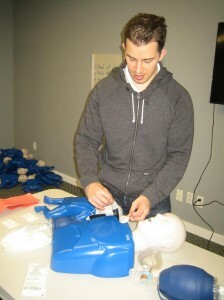 Regina First Aid offers numerous training courses and classes to trainees. Schedules for training courses and classes are available throughout the whole week. Should there be problems with scheduling, private classes are also available for enrolment to trainees. No other St Mark James training service provider has better maintained training locations with high-end equipment. The staff at Regina First Aid boasts the most welcoming and easiest-to-approach trainers, who are the best in their fields of expertise. Regina First Aid is proud of having the very best learning establishments for first aid, CPR, AED, food safety, and re-certification training. All of the first aid, CPR and AED training courses offered are over-viewed by St Mark James. Trainees who finish their training course will get a 3-year, St Mark James first aid and CPR license. Renewal of certification is also available through recertification courses. Go on, register for a class today! Compressions – Compressions are the most critical component of CPR and must start as soon as possible. Airway – After a set of 30 compression rescuers should open the airway. Breathing – With an open airway rescuers should attempt 2 rescue breaths for every 30 compressions. To learn the effective methods of CPR enrol in a CPR and AED course in Regina, Saskatchewan.